The 8-Week Blood Sugar Diet sets out a bold and radical program that involves you sticking to around 800 calories a day for up to 8 weeks. This intensive approach is the fastest way to see change, and the recipes in this book have been designed with that goal in mind. 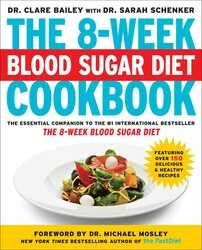 Here are some tips, from The 8-Week Blood Sugar Diet Cookbook, to help guide you to that ultimate health goal. 1. Plan in advance and aim for variety to maintain interest and nutritional balance. Many people have meals planned, or even ready the day before, so they don’t give into temptation. 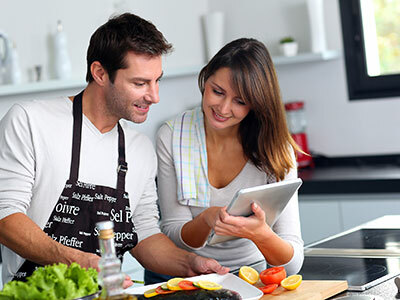 We suggest ideas for quick and easy dishes to assemble the night before so you can dash out in the morning with a healthy breakfast on board, as well as tips for preparing something that you can have ready and waiting for you when you get home from work. The first 2 weeks might be tough, but most people find their body gets used to it. As their stomach shrinks and their insulin resistance improves, most people find their constant cravings settle and they don’t want so much to eat. In fact, the majority of people say that they feel hugely better and have more energy. 2. Increase water intake to reduce the side effects of calorie cutting, such as tiredness, lightheadedness, and headaches (these are often related to dehydration and sometimes insufficient salt intake), hunger (this comes in waves and passes so try to “surf the wave”) and feeling colder. Aim for 2 to 3 quarts a day. You can also add a bit more salt to food. 3. Drink soup as it’s surprisingly satiating as well as cheap and practical. You can take it to work for lunch and keep portions in the freezer. 4. Use low-carb alternatives for potatoes, pasta, and rice. We have included all sorts of tips and tricks to help you with this. Try grated cauliflower instead of rice, spiralized vegetables or finely sliced cabbage instead of pasta or noodles. 5. Avoid sugar and sweet syrups wherever possible, even if they are “natural” sugars. Where a savory dish needs a touch of sweetness use whole fruit if you can; its impact is reduced when it is eaten with fats and fiber, which slows its absorption. 6. Drink hot drinks to suppress your appetite: teas, coffee, miso soup, etc. 7. Beware hidden calories in drinks. Alcohol is surprisingly high-calorie so avoid it if possible during the diet. Other unexpected liquid calories include fruit juice, smoothies, and cordials. 8. Avoid “diet” products as they often contain sugar and/or sweeteners to make them more palatable. And they don’t reduce sweet cravings. 9. Build in strong flavors with the likes of lemon, pepper, lime, red pepper flakes, garlic, gherkins, mustard, and herbs. It is a great way of making food more satisfying. 10. Use a nutritional counter such as My Fitness Pal to measure and track your meals, especially if you are not always following the menu planner in this book, to ensure that you get a healthy nutritional balance in your diet. 11. Take multivitamins at least every other day, if you can, particularly if you are doing 800 calories for more than a few weeks. The recipes have been designed to ensure that you get a balanced diet with adequate protein, fat, and nutrients but a multivitamin won’t hurt. 12. Share meals with others where possible. It is important not to become isolated on any diet. Just remember to have smaller portions of the same food where you can and skip the carbs. Friends and family might benefit, too.